ASAP Super A+ Serum is the newly formulated version of ASAP Super A Serum, after continuous research to ensure ASAP's skin care products contain the latest technology, highest quality and most effective ingredients available. 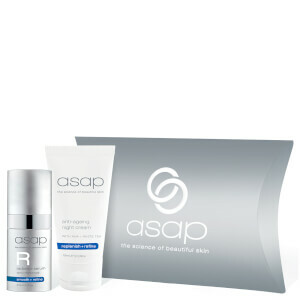 ASAP super A+ Serum is a high potency overnight revitalising treatment containing Vitamin A (Retinol) to help stimulate collagen production and a cutting-edge biomimetic peptide that speeds up cell renewal, and cross linked Hyaluronic Acid that provides 5 times the moisturising power and 50 times the moisture retaining properties of traditional Hyaluronic Acid. It also contains White Tea and Vitamin E to help diminish the appearance of sun damage/pigmentation and assist with skin tone and texture. Scientifically formulated to reduce the visible signs of ageing, while providing protection from free radical damage.